NASA banned from contact with Russia and China: Politics and the ISS. It’s a bad idea to play politics in space. 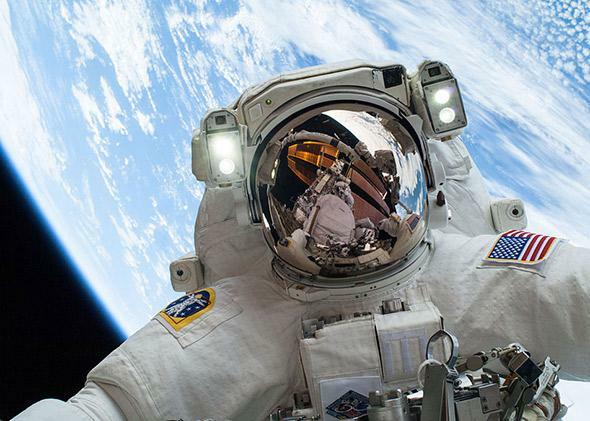 NASA astronaut Mike Hopkins participates in the second of two spacewalks outside the International Space Station on Dec. 24, 2013. So NASA has been dragged into the fallout over Russia’s seizure of Crimea from Ukraine. An internal memo, made public this month, revealed the space agency has suspended contact with Russia except for that concerning International Space Station operations. The memo stated that the suspension “includes NASA travel to Russia and visits by Russian government representatives to NASA facilities, bilateral meetings, email, and teleconferences or videoconferences.” This was confirmed in an official statement from NASA. Will this action influence Vladimir Putin and his apparent dream of geographically reassembling parts of the Soviet Union as a new Russian empire? That’s highly unlikely. So why do it? Space has a long history of serving as a surrogate for demonstrating U.S. displeasure about foreign or domestic policy actions in other countries. Though examples date back to the Cold War, the most recent case relates to China. China has been banned for years from participating in the ISS because select members of the U.S. Congress consider it inappropriate to work with a communist government. In addition, NASA has been legislatively banned from having bilateral relations with China since 2011. While ostensibly that ban relates to concerns about technology transfer, the underlying reason has as much or more to do with Chinese restrictions on religious freedom. But China has neither changed its type of government nor its policies on religious freedom based on exclusion from the ISS or its relative isolation from meeting with NASA officials, nor is it likely to. In fact, China has pushed ahead with its own robotic lunar program and human space-flight program, and it works with many other countries, including Russia, in space. When the Soviet Union collapsed and the Cold War ended, the United States pragmatically merged its human space-flight program, specifically the ISS program, with the Soviet Mir space station program inherited by the new Russian state. The pragmatic intent was to keep lots of otherwise potentially unemployed Russian scientists and engineers from taking jobs in countries with dubious “space” programs. After all, space technology is largely dual use, of value to both military and civilian communities. The basics of rocket technology and missile technology are largely symbiotic. It seemed a good idea at the time. Then, after spending decades building the ISS, the United States canceled the space shuttle, the vehicle originally intended for transport to the ISS as part of its post-Apollo program. The first resident crew arrived at the ISS in 2000 aboard a Russian Soyuz spacecraft, but shuttle missions soon followed. After the shuttle’s last flight in 2011, though, the United States became dependent on Russia for transport to the ISS, using Soyuz at a cost of nearly $71 million for each seat it requires. Such dependence inherently carries risk. Given Russia’s democratic government (democratic only if you squint hard when looking at it), it seemed a reasonable risk. Enter the egotistic, ambitious, and maybe ruthless Putin. NASA astronaut Robert L. Curbeam Jr. (left) and European Space Agency astronaut Christer Fuglesang work on the International Space Station in December 2006. It would be hypocritical to say the least for the United States to ban bilateral space relations with China over general displeasure with its form of government and policies on religious freedom but continue business as usual with Russia after it had just annexed the sovereign territory of another country. The problem is the United States and Russia are tied at the hip on the flagship ISS program, which is currently scheduled to be operational until at least 2024, hence the exemption for communication concerning the ISS. Undoubtedly, there will be finger-pointing in Congress about how and whose responsibility it is that the United States is dependent on the Russians, which doesn’t seem so prudent now. Whether that for-the-camera, useless blame game can translate into much needed political will to accelerate backup plans for ISS transport remains to be seen, because acceleration and diversification would involve a lot of money. NASA’s suspension of working with the Russians will likely be received in Russia much the same way other sanctions over its actions in Ukraine have been: with ridicule. Regrettably, Putin holds all the cards or, more specifically, the keys to the rocket capable of getting crews to the ISS. The next move is up to him. Retaliation from Russia should not be ruled out, and the United States needs to prepare for that. Congress likes to insert itself into space policy, and now seems a good time to do so. There are two immediate needs: accelerating the diversification of ISS transport options and rethinking the propensity of using space as a foreign policy surrogate. The bigger issue, however, is how to reassert U.S. space leadership. Without finally dealing with that, the United States may increasingly find itself being “pushed around” in space.